The joy of beautiful jewellery should be shared by everyone. Chapelle Jewellery offer the most stunning pieces at incredible prices so you can enjoy luxury jewellery every day. Sign up to their newsletter to discover all they have to offer. From dainty anklets, beautiful diamond earrings, sapphire necklaces and bespoke brooches to pretty bangles, statement rings, white gold pendants and more. You can find the perfect gift for yourself or your loved one with Chapelle Jewellery. All of their jewellery and watches are at least 30% off the RRP, you can be sure to find the perfect piece at the best price. 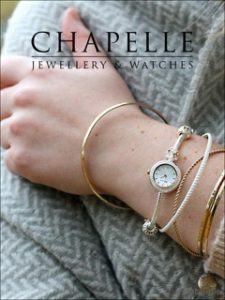 The experts at Chapelle Jewellery are there to assist your every need, if you need some advice or need more information about the ranges they offer, they can help! Sign up to the Chapelle Jewellery Newsletter today and discover their range of incredible watches for men and women – with brands from Radley, Rotary, Citizen and Casio to Diver, Cluse, Barbour and Fossil. At such incredible prices you won’t be able to say no!